Who was this man? Interestingly, he does not have a name. He is only referred to as the “man blind from birth.” This is significant in the Gospel of John because the lack of a name is also seen, for example, in the story of “the woman at the well.” The fact that there is no name indicates that we should see ourselves in this story. “Blindness” is our inability to see the hand of God at work all around us. We struggle to see the daily miracles of God’s grace alive in our lives and alive in the lives of others. So the first thing we should do with this Scripture is strive to see our lack of sight. We should strive to realize that we so often do not see God at work. This realization will inspire us to desire a spiritual healing. It will invite us to want to see God at work. 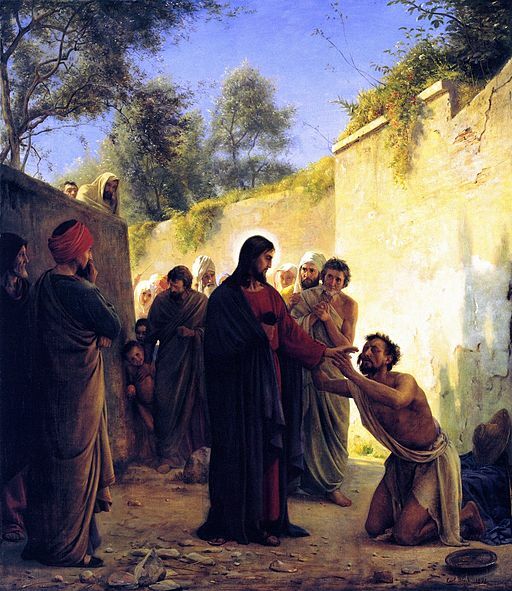 The good news is obviously that Jesus cured this man, as He willingly cures us. To restore sight is easy for Jesus. So the first prayer we should pray as a result of this story is simply, “Lord, I want to see!” The humble realization of our blindness will invite God’s grace to work. And if we do not humbly acknowledge our blindness, we will not be in a position to seek healing. How He heals this man is also significant. He uses His own spit to make mud and smear it on this man’s eyes, which is not immediately that appealing. But it does reveal something quite significant to us. Namely, it reveals the fact that Jesus can use something exceptionally ordinary as a source of His divine grace! If we look at this in a symbolic way we can come to some profound conclusions. Too often we look for God’s action in the extraordinary. But He so often is present to us in that which is ordinary. Perhaps we will be tempted to think that God only works His grace through heroic acts of love or sacrifice. Perhaps we are tempted to think that God is not able to use our daily ordinary activities to perform His miracles. But this is not true. It is precisely those ordinary actions of life where God is present. He is present while washing the dishes, doing chores, driving a child to school, playing a game with a family member, carrying on a casual conversation or offering a helping hand. In fact, the more ordinary the activity, the more we should strive to see God at work. And when we do “see” Him at work in the ordinary activities of life, we will be healed of our spiritual blindness. Reflect, today, upon this act of Jesus and allow our Lord to smear His spit and dirt on your eyes. Allow Him to give you the gift of spiritual sight. And as you begin to see His presence in your life, you will be amazed at the beauty you behold. Lord, I want to see. Help me to be healed of my blindness. Help me to see You at work in every ordinary activity of my life. Help me to see Your divine grace in the smallest events of my day. And as I see You alive and active, fill my heart with gratitude for this vision. Jesus, I trust in You.